"In the band God of Shamisen, world music, rock and heavy metal take each other to the mat, spurred into action by the sound of a three-stringed Japanese lute called the shamisen." 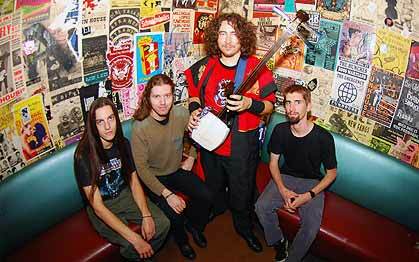 God of Shamisen is the world’s first rock band to combine elements of metal, funk, and progressive rock with the Tsugaru-Shamisen, a fretless lute from Northern Japan. Effectively merging the cultures of east and west, this mostly-instrumental outfit is unleashing a unique sound and a worldwide perspective to battle conventional music. Since their inception in late 2004, God of Shamisen has earned a reputation for their energetic live shows, which they’ve brought to a variety of venues: recital spaces, cultural faires, seedy metal clubs, and conventions. "downright savage in its intensity"
And the "Judges Choice" Award at the Hirosaki Championship tournament May 4, 2005. In both 2006 and 2007, Kevin placed Nyusho (runner-up) at Hirosaki and Jyun Yuusho (2nd place) at Kanagi. In December, 2008, Kevin released his major label debut on EMI Japan, with God of Shamisen as his band. You can read more about this CD here, in Japanese. Background: BFA Music composition degree from Cal Arts School of Music (1995). Performed with the J.S. 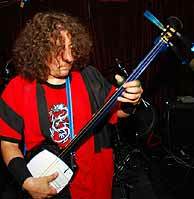 Bach Experience in the late 90s and moved to Santa Cruz in 2003. after approximately 20 years as a rock guitarist and wacky composer, Kevin was kidnapped in northern Japan where he was forced to learn the local art of Tsugaru Shamisen. Emerging as a shamisen master, Kevin returned to his new home in Santa Cruz, California, where he has recently worked with the phenomenal Estradasphere. Kevin's goal is to create a true fusion of cultures by combining traditional Tsugaru Shamisen with modern rock, surf, metal, funk & noise! Background: Lee studied at Atlanta Institute of Music under the direction of Tom Knight. Listening to Metallica at an early age inspired Lee to start drumming at the age of 10. His brother bought a drumset and he started playing it. 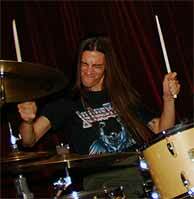 Moved from Atlanta to Santa Cruz in 2004 to join the local legends Estradasphere as their permanent drummer. Karl picked up the guitar at age 13 with the hopes of becoming the next Kurt Cobain. When that plan fell through, he started taking guitar lessons from Mike Williams, a veteran guitar teacher and director of the Soundwall Music Camp for rock music. He also played jazz with his high school during that time. Karl joined GOS in February of 2007, but collaborated with the band on stage and in the studio many times since its early days in 2005. 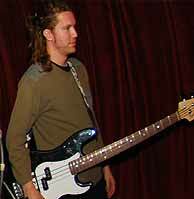 Mark has been playing guitar and bass for an unidentifiable number of years. Officially the band's bass player, he has played bass, guitar, keyboards and occassional vocals for the band's live shows. 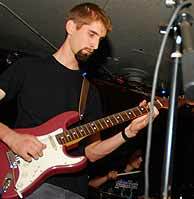 An early GOS recruit when Kevin formed the band, Mark has been handling the production reins on the band's first full-length album Dragon String Attack and is unofficially in charge of the band's visual design.